A century ago, Albert Einstein published his famous theory of relativity. He proposed that all objects physically warp the fabric of space, with larger masses producing a more pronounced effect, and very massive objects (such as the Sun) causing light to travel along curved paths through space. Such an effect was first observed during the 1919 solar eclipse by English astronomer Arthur Eddington. Researchers had to wait a century, however, to get a telescope powerful enough to detect this gravitational microlensing caused by a star outside the Solar System. Even around objects with very large masses, such as stars, this effect is very slight, making such detections extremely challenging for ground-based telescopes. It is, however, within the capabilities of the NASA/ESA Hubble Space Telescope, which gathered the data comprising this Picture of the Week. 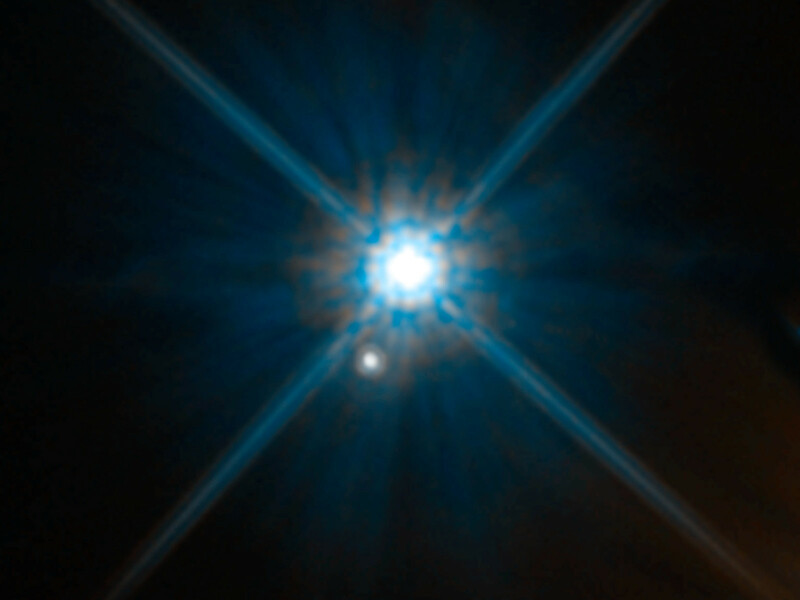 The bright star in the centre of the image is the nearby white dwarf Stein 2051B, only 17 light-years from Earth. 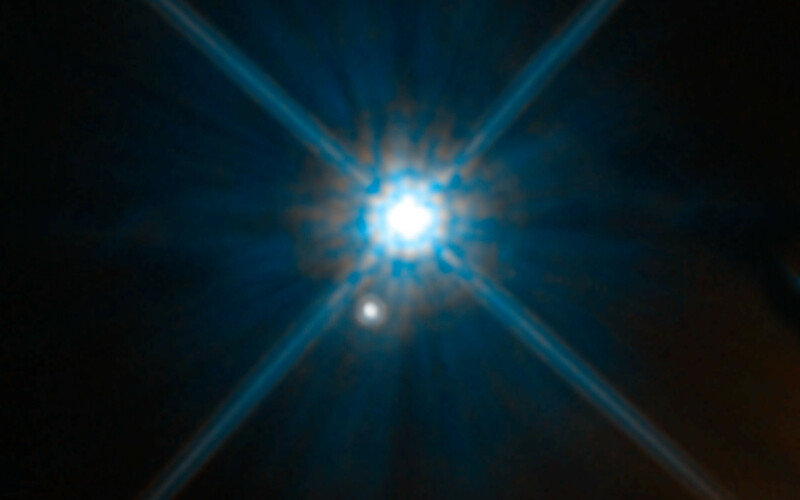 The smaller star below is about 5000 light-years away. Astronomers observed Stein 2051B eight times within two years while the white dwarf travelled in front of of the distant background star. During the close alignment, the white dwarf’s gravity bent the light from the distant star, making it appear offset by about 2 milliarcseconds from its actual position. This deviation is so small that it is equivalent to observing an ant crawl across the surface of a 1€ coin from 2300 kilometres away. Position (Dec): 58° 58' 13.75"